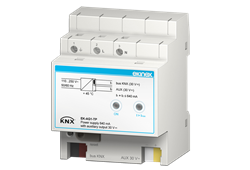 The ekinex® power supply EK-AG1-TP is a KNX device for rail mounting which produces and monitors the 30 Vdc voltage required to operate the bus system. The device is equipped with an additional output 30 Vdc that may be used for the auxiliary power supply of other SELV devices. The device has an integrated choke which provides the decoupling between the power supply and the information on the bus line. On a KNX bus line can be connected up to 64 KNX bus devices. The total current absorbed from the two outputs (KNX bus and auxiliary) cannot exceed 640 mA. The output is protected from overload and short circuit. The device can support short interruptions of the mains voltage (max 200 ms).